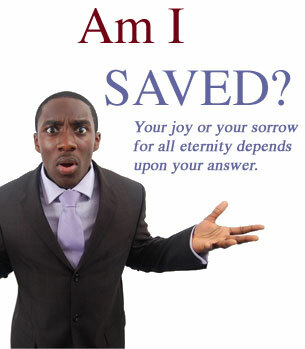 It is not a question of how good you are, nor if you are a church member, but are you saved? Are you sure you will go to Heaven when you die? First, you must realize you are a sinner. "For all have sinned, and come short of the glory of God" (Romans 3:23). Because you are a sinner, you are condemned to death. "For the wages of sin is death" (Romans 6:23). This includes eternal separation from God in Hell. "...it is appointed unto men once to die, but after this the judgment" (Hebrews 9:27). But God loved you so much He gave His only begotten Son, Jesus, to bear your sin and die in your place. "...He hath made Him to be sin for us ...that we might be made the righteousness of God in Him" (2 Corinthians 5:21). Jesus had to shed His blood and die. "For the life of the flesh is in the blood" (Lev. 17:11). "...without shedding of blood is no remission" (Hebrews 9:22). "...God commendeth His love toward us, in that, while we were yet sinners, Christ died for us" (Romans 5:8). "God...commandeth all men everywhere to repent" (Acts 17:30). This repentance is a change of mind that agrees with God that one is a sinner, and also agrees with what Jesus did for us on the Cross. In Acts 16:30-31, the Philippian jailer asked Paul and Silas: "...'Sirs, what must I do to be saved?' And they said, 'Believe on the Lord Jesus Christ, and thou shalt be saved...' "
Simply believe on Him as the one who bore your sin, died in your place, was buried, and whom God resurrected. His resurrection powerfully assures that the believer can claim everlasting life when Jesus is received as Savior. "But as many as received Him, to them gave He power to become the sons of God, even to them that believe on His name" (John 1:12). Just pray: "Oh God, I know I am a sinner. I believe Jesus was my substitute when He died on the Cross. I believe His shed blood, death, burial, and resurrection were for me. I now receive Him as my Savior. I thank You for the forgiveness of my sins, the gift of salvation and everlasting life, because of Your merciful grace. Amen." Your soul is worth more than all the world. "For what shall it profit a man, if he shall gain the whole world and lose his own soul?" (Mark 8:36). Be sure you are saved. If you lose your soul, you miss Heaven and lose all. Please! Let God save you this very moment. God's power will save you, keep you saved, and enable you to live a victorious Christian life. "There hath no temptation taken you but such as is common to man: but God is faithful, Who will not suffer you to be tempted above that ye are able; but will with the temptation also make a way to escape, that ye may be able to bear it" (1 Corinthians 10:13). Do not trust your feelings. They change. Stand on God's promises. They never change.